By coincidence, we were in Darwin (in 2013) at the very moment the World Solar Challenge started. We had heard about it before, and seen images on the Belgian telly, but it was much better to experience this live! The Solar Challenge is a race to cross Australia from north to south in a handmade car that only uses solar energy. One Belgian team competed, students from the University of Leuven, amongst about 40 teams from all over the world. The car has to meet all the requirements set out in a regulation of about 70 pages, that changes every 2 years when the race takes place … The cars are checked and tested by scrutineers, but no problems for the Belgian team! Next step is the qualification on the Hidden Valley race track. Each car can do 3 laps, the fastest one counts for the starting position in the race. Belgium did a very good job, starting as sixth in their class. 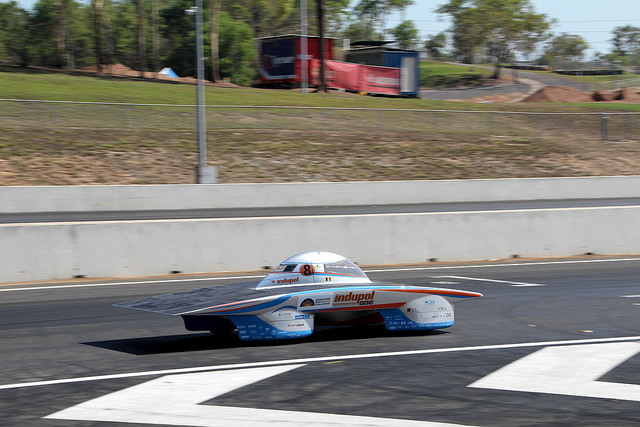 There are three classes: challenger – driving as fast as possible to Adelaide, cruiser – these cars almost look like normal cars, and adventure – mix of anything on solar energy or cars that didn’t pass the scrutineering. In the race, the cars can drive from 8 AM till 5 PM, they stop and sleep wherever they are at that moment. The Belgian team had three drivers, and a lot of back-up to help them out, cars behind and before the solar car, checking the weather, telling the pilot at what speed to drive etc. , and hopefully discourage any animal trying to cross the road at the wrong timing. solar race start Darwin from Travel for Motion on Vimeo.